Weevils and curculios comprise a large family of small, typically snout-nosed brown or black beetles. They feed at night and hide under leaf debris or in the soil during the day. 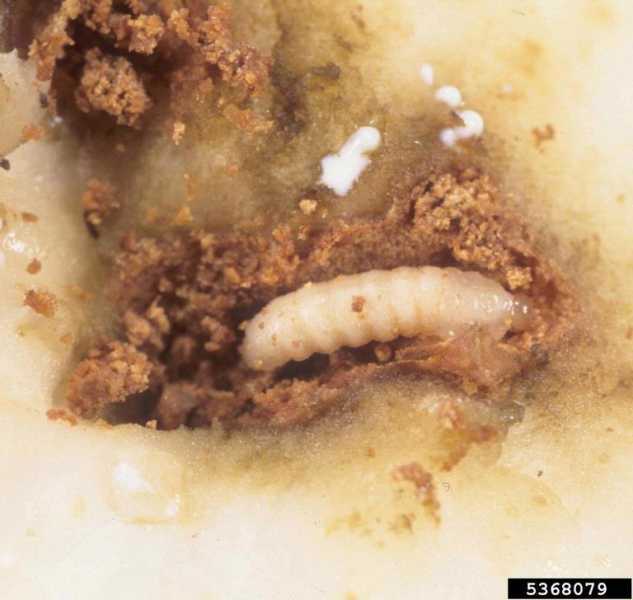 Their larvae are small whitish grubs which feed within the fruit, stem, or roots of plants. Eggs are typically laid on--and sometimes actually injected into--susceptible plants. Check suspect plants and their fruit for telltale zigzag paths. Often, many generations of these pests occur in a year. 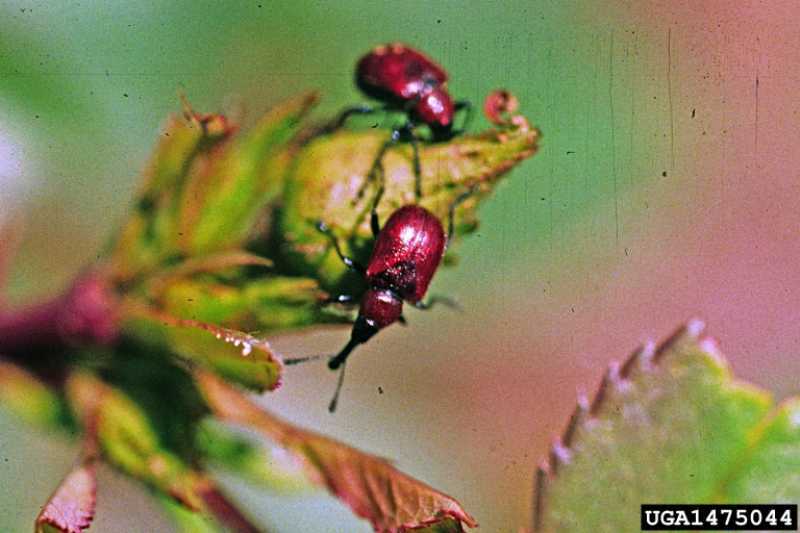 Flowering plants vulnerable to curculio and weevil damage include coralbells, iris, lily, and rose. Susceptible fruits and vegetables include apples, blueberries, cherries, peaches, pears, plums, raspberries, rhubarb and strawberries. 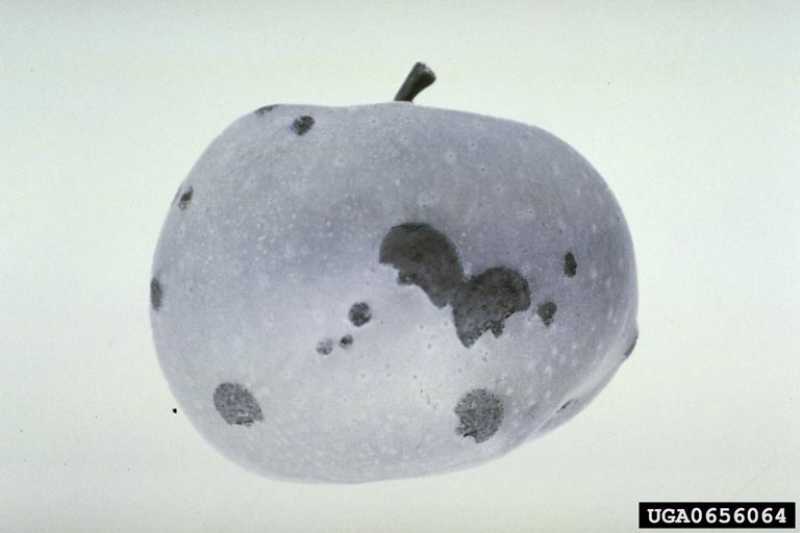 Several nut trees are also prone to weevil damage, among them butternut, hickory, pecan and walnut. 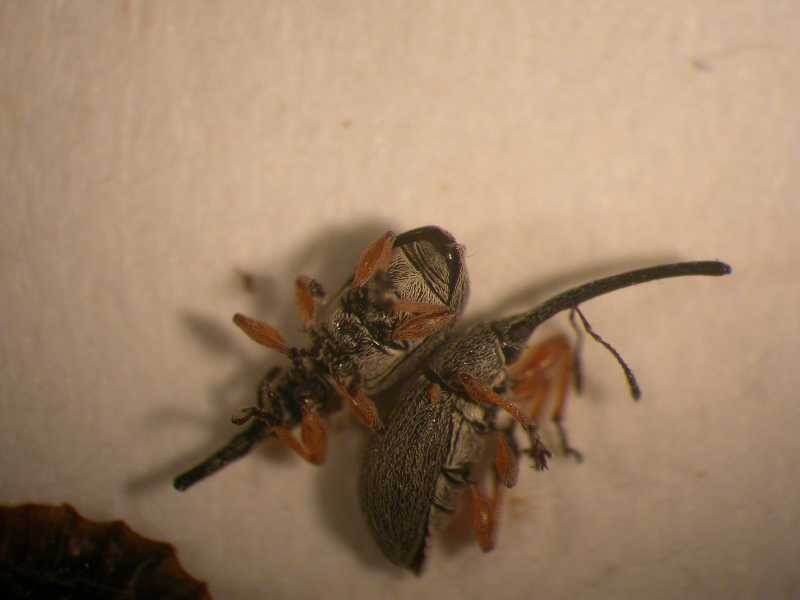 Some species of weevils carry the dreaded Dutch elm disease, although they are not the primary transmitters of this scourge. The best control strategies start with a regular inspection of susceptible plants. As soon as weevils appear, begin spraying weekly with pyrethrum or sabadilla, making sure to cover all leaf surfaces. Repel weevils by dusting around the base of the plant or thoroughly dusting the plant itself with diatomaceous earth. 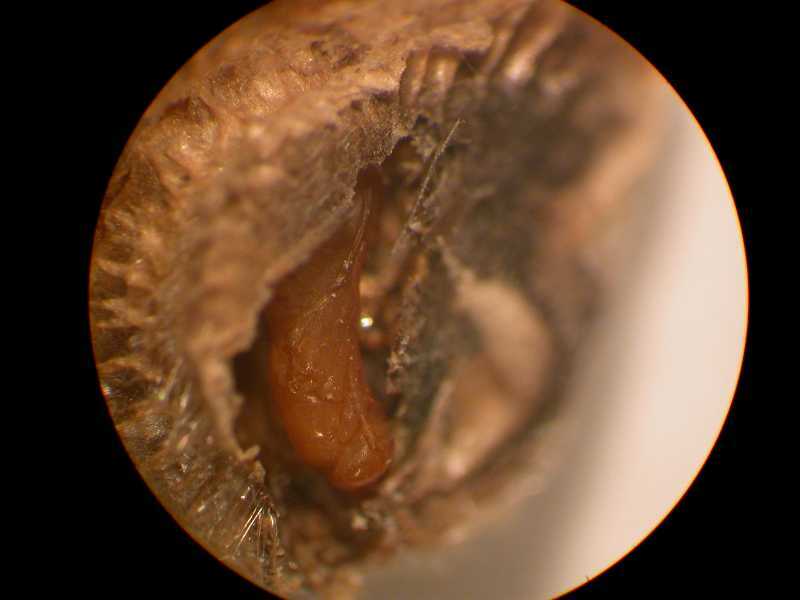 Commercially available predatory nematodes can help stop the reproduction of weevils. Effective preventive measures include weed control, cleanup and destruction of dead plants and any tree fruit or nuts that fall prematurely, and crop rotation. Attract predatory birds to your yard such as bluebirds, warblers, and wrens. Specific recommendations for flowering plants. Curculio and weevils damage flowering plants by eating holes or notches in leaves, and sometimes by rolling or curling them. They can defoliate plants, cause them to wilt or their crowns to become stunted or die. 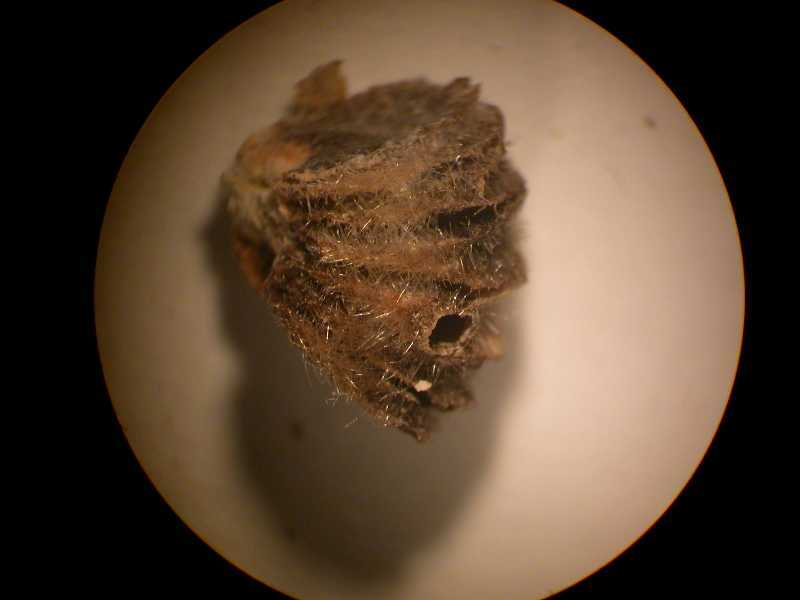 Rose curculio will eat into rosebuds which will dry up and fail to open. Since these insects sleep during the day, they can easily be shaken from plants and destroyed; just spread a cloth beneath the plants, gather the startled beetles, and destroy them in a jar of soapy water or kerosene. In addition, spray infested plants weekly with a solution of isopropyl alcohol and pyrethrum mixed at the rate of one tablespoon per pint, respectively; apply preferably after dark, when the adult weevils feed. Dig and discard badly infested specimens, together with the soil in which they are growing. Prune and destroy damaged rosebuds.